A North Texas family has found the owner of a peahen that showed up on their back patio Wednesday morning. Nikki Brewer said the hungry peafowl looked like it was ready to come out from the cold and into her warm house Wednesday morning. "We fed it a little bit of bread on our porch, and it was very skittish when we got close to it, but we knew it had to belong to someone," Brewer said in an email. 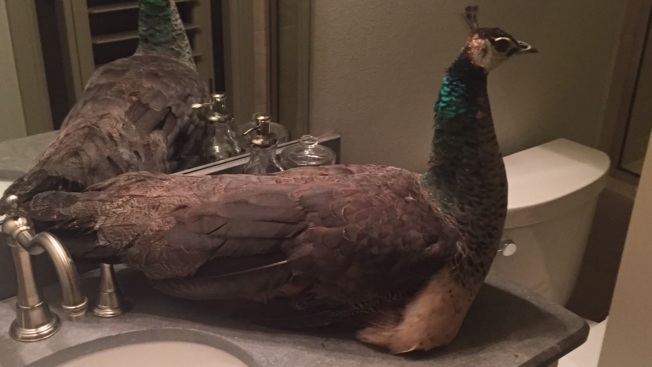 Brewer said the peahen, which is a female peacock, has been "waiting patiently" in her bathroom while she tried to track down the owner through Facebook groups and Nextdoor. Around midday Thursday, the owners of the wayward peahen were located.